Can you believe it is time for a NEW Stampin’ Up! catalog? I can hardly believe a year has almost passed and we are on the cusp of retiring products and supplies—only to WELCOME a brand new catalog filled with new stamp sets and products! So friends, take a look at this list. There are many items retiring. Please know that new stamps will be either photopolymer or red rubber. The red rubber with have the NEW CLING layer. This new adhesive holds the stamps PERFECTLY to the acrylic block!! Here is the list of items we will be saying ‘good bye’ to–VERY SOON! SO if any of these are on your list of must-haves, please order now! All of the 2017-2019 InColors are also retiring! Once they are gone, they too are GONE! This means all the cardstock, ink pads, ribbons, refills and markers! Please let me know if I can help you! Love You To Pieces meets Reese’s Pieces! When I saw how CUTE Love You To Pieces stamp set was, I knew I had to have it! I see so many possibilities with it – in all colors and with lots of candies! These were so easy to make! A few Reese’s Pieces in out little cello bags –topped over with a piece of Daffodil Delight card stock. Then I used the FUN puzzle pieces from the Love You To Pieces stamp set! FUN FUN FUN and I think cute! Can’t you also see this set being used for other occasions? Reminder about Online Extravaganza! Weekly Deals! This is going to be an AMAZING SALE! Remember — these prices last until supplies run out so don't delay!!!!! Ok friends –back to Oscar time! BTW –Tucson is 70-75 daytime and nights are around 45- 50…………………………. I sure can take this weather!!!!! hugs to all and be back soon! I am so excited about tomorrow's class!!! Looking forward to seeing my guests tomorrow!!!! Retiring Stampin ‘ Up! products and Weekly Deals! Ok so I'm having a tad difficulty copying the graphic for you. It is LONG……. I HOPE you can see it properly! I'll add the Weekly Deals to another newsletter right now. I can't get it in here as well!! Me and technology! A BIG LOL!!!! Stamp A Stack and cards! Stamp A Stack will be May 2, 2015 at my home in Franklin. Twenty EASY yet very NICE cards! 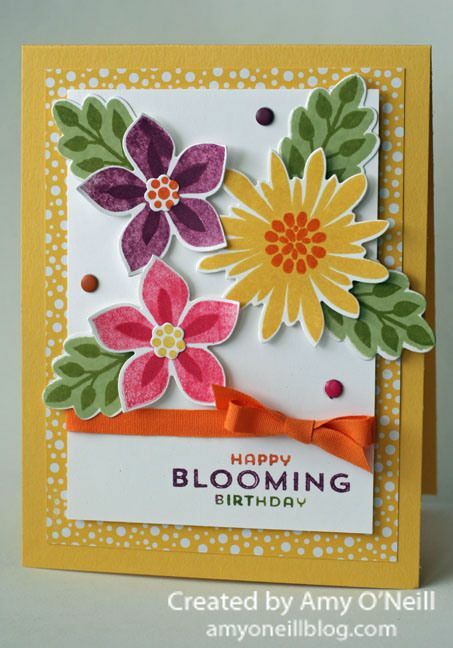 All Abloom and Adventure Bound Paper stacks plus embellishments! PLEASE sign up no later than April 24th! As you can see, this card is COPIED form Amy O'Neil. I LOVE it and think you will too! It may be slightly adapted–not exactly as you see it but that's how we roll!! LOL! A few more cards TBD –but I think you'll love our selections! have a GREAT Patriot's day Weekend! Stay strong Boston–and all of us!